The Brooklyn range of industrial furniture brings a touch of loft living style to any home, softened with the subtle grain patterns of solid oak. Bring a touch of New York loft living style into your home, with this striking industrial furniture range by Oak Furniture Land. Constructed with a high quality metal frame, with beautiful solid oak panels, it suits a wide range of interior styles, from the industrial-chic to the modern farmhouse, and everything in between. 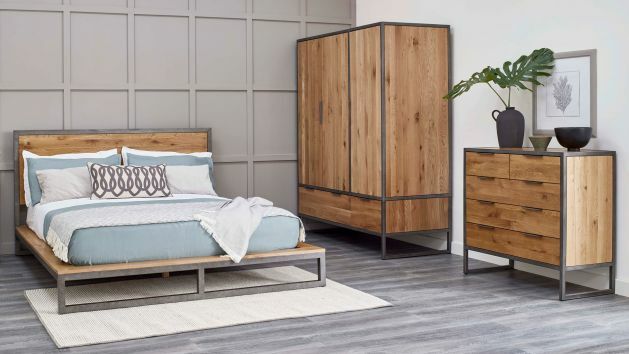 The Brooklyn collection of oak and metal furniture combines plain natural oak fronts, with a clear wax finish that brings out the grain patterns. The frame has a simple clean design, and the handles have clean metal lines. Browse Brooklyn pieces for every room today, all with free delivery to your room of choice, as standard.